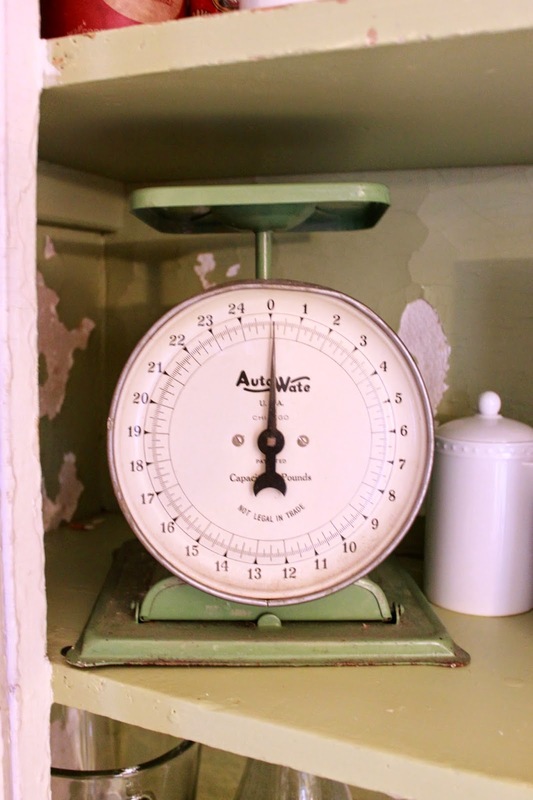 When my husband and I started researching our home, we had a strong hunch that our kitchen dated to the 1940s or 1950s. 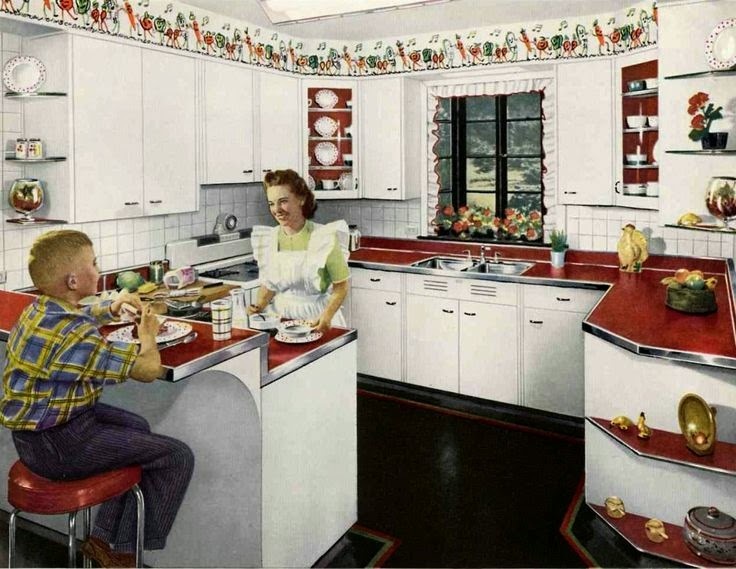 We didn't have any concrete evidence, just a vague conception of what a retro, post-war American kitchen would look like: white cabinets, Formica counters, linoleum floors, cherry red accents, and kitschy wallpaper. In other words, we thought that many 1940s or 1950s kitchens had looked exactly like the kitchen in our new home. It turns out we were right. Here's our kitchen, in all its retro glory. And here is an ad I found in the Retro Renovation kitchen gallery for a 1940s kitchen by the company St. Charles. The St. Charles kitchen has white steel cabinets, chrome handles, a tile backsplash, black/red linoleum floors, and cherry red Formica counters edged in chrome. Unless my eyes deceive me, the wallpaper features an assortment of happy, singing vegetables who are performing some sort of jig. If the St. Charles kitchen had a long-lost brother, it would be our kitchen. We also have white cabinets, chrome handles, and cherry red Formica counters edged in metal. However, there are some noticeable difference between the two kitchens. St. Charles was known for their high-quality steel cabinets. Our cabinets are made of wood, and some of the cabinets have been covered with so many coats of paint that the doors no longer close properly. We don't have that snazzy breakfast bar (or that cute kid!). Whereas the St. Charles kitchen has a shiny black linoleum floor, ours is a greenish off-white faux-brick linoleum that's starting to come unglued. 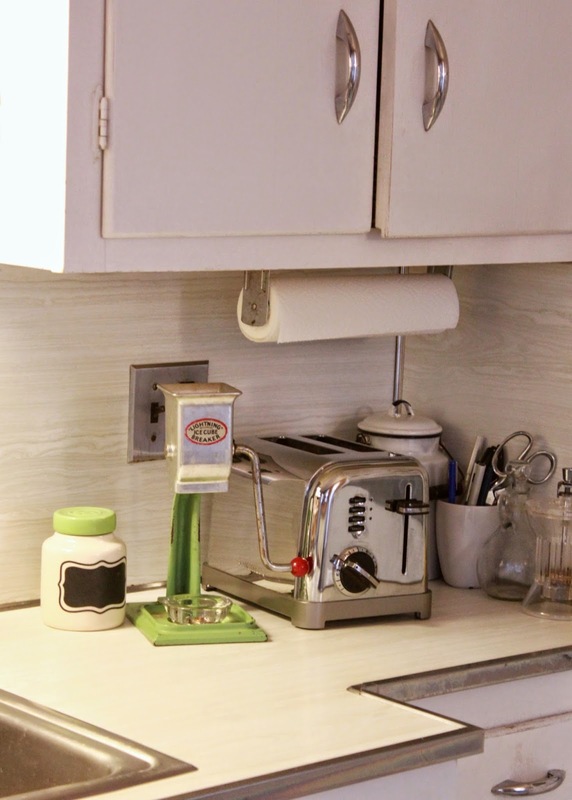 The St. Charles kitchen has a tile backsplash, but ours is white faux wood-grain Formica, which carries over to the countertops around the sink. However, we do have white vinyl "tiles" on the right wall of our kitchen, extending about four feet above the floor. I bet you're starting to feel jealous, aren't you? Faux-tile wall accent. 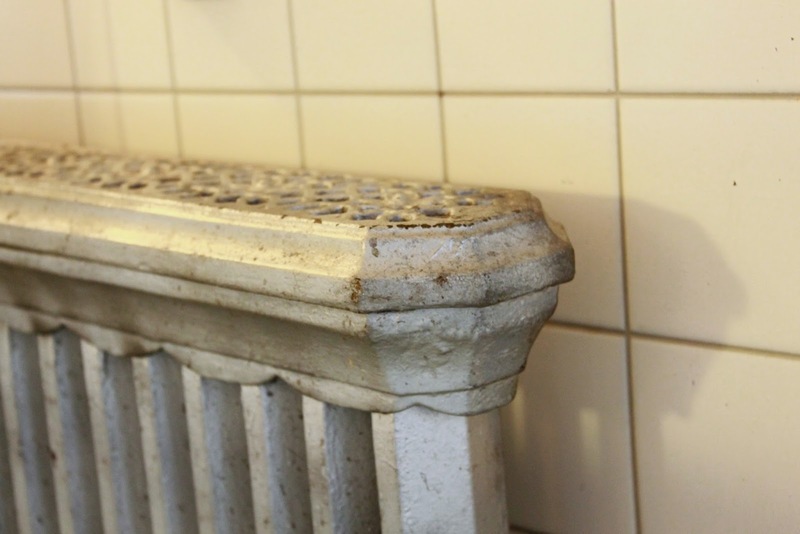 The radiator was patented in 1897! Sadly, we're lacking those musical vegetables on our wallpaper (aww, shucks!). Instead, our wallpaper looks like someone decided to gather the entire contents of their fridge, arrange the items in random piles, and paint a picture. The end result? Ivory wallpaper with an assortment of apples, pineapples, pears, strawberries, grapes, squash, pumpkins, cabbage, corn, peppers artichokes, and a picnic basket. Plus a few tea kettles, just for good measure. I suppose this is fine example of "everything but the kitchen sink." Beneath the tea kettle wallpaper, we discovered another layer of paper. The older wallpaper has been badly discolored by the adhesive that was used to apply the tea kettle paper. Based on what we can see, it appears that this older paper was originally a light cream with rows of ivy and small, delicate flowers in yellow and pink. 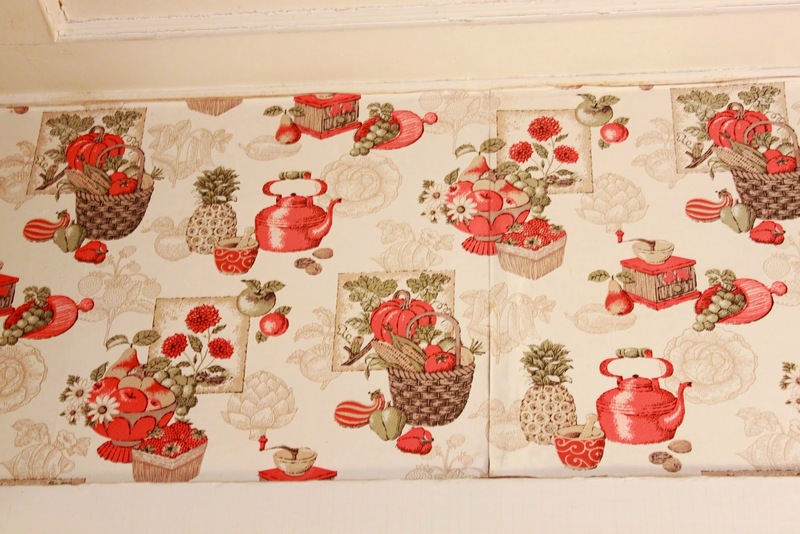 While browsing vintage wallpaper suppliers such as Hannah's Treasures and Rosie's Vintage Wallpaper, we noticed that ivy patterns seemed to be popular during the 1940s. 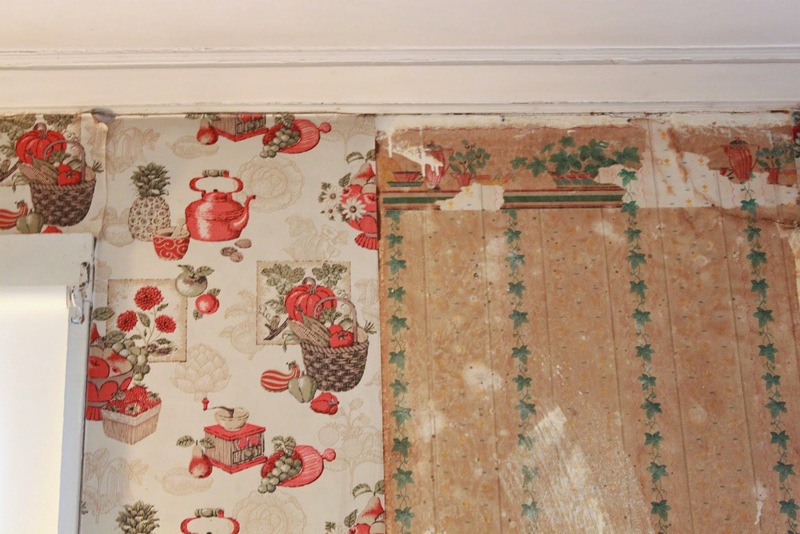 We've therefore concluded that our ivy wallpaper is likely from the 1940s, as well. 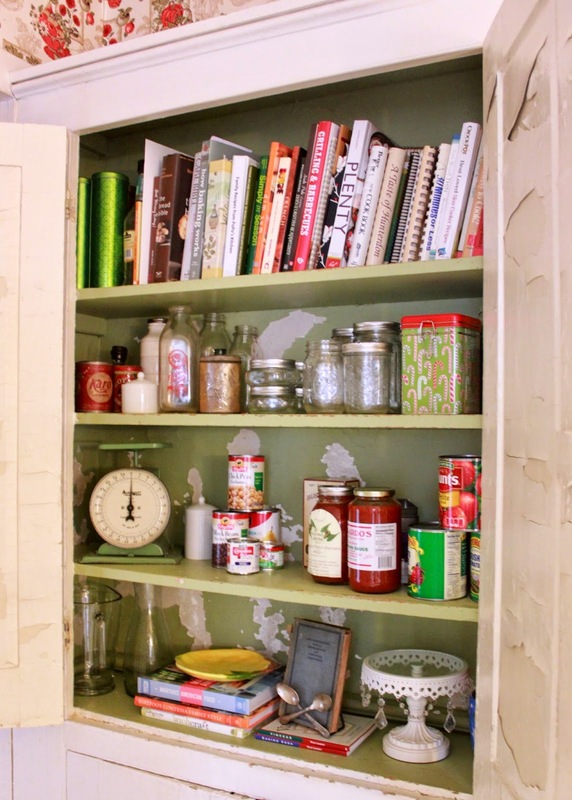 Our plan for the kitchen is to work with -- rather than against -- the existing décor. 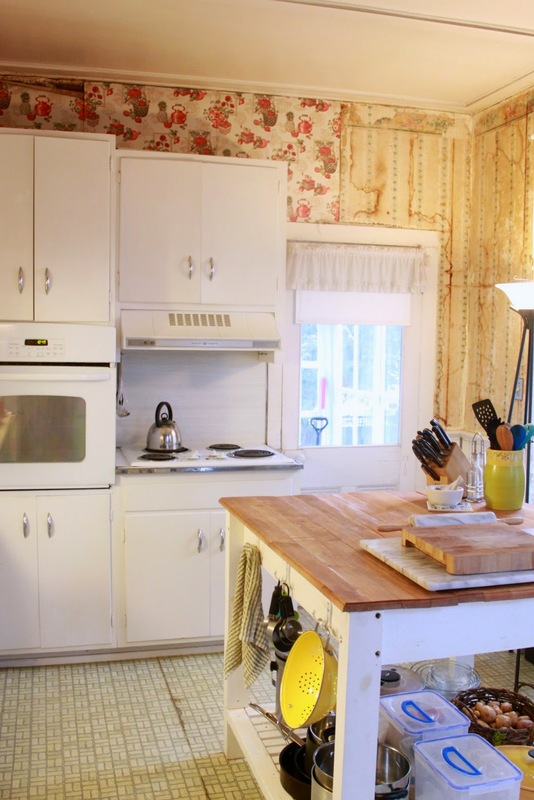 Call us crazy, but we find the kitchen quaint and charming. Sleek, contemporary designs have never been our thing. 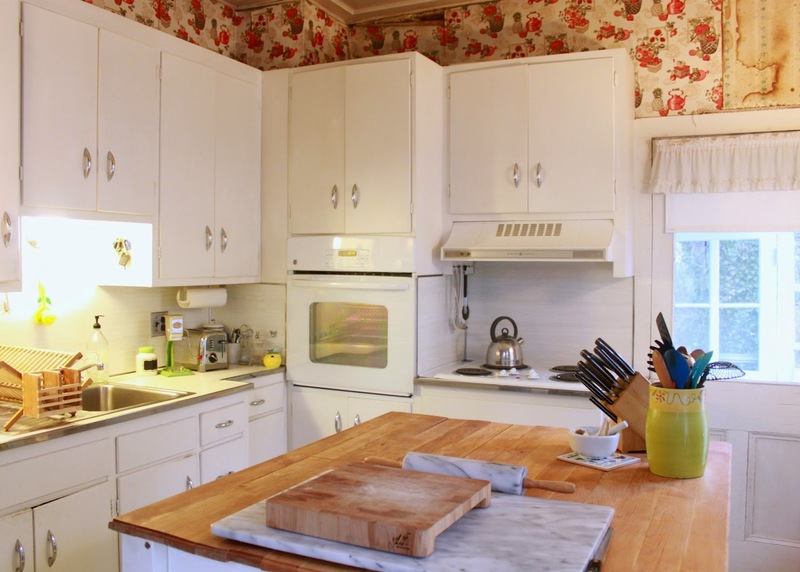 We're rather fond of the comfortable, kitschy feel of our kitchen. 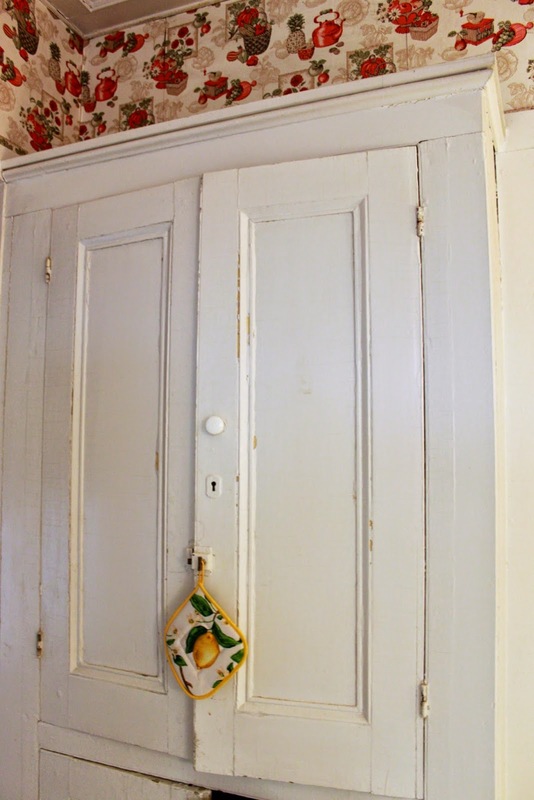 In fact, several of our antique housewares already look perfectly at home in our new kitchen, particularly when stored in the built-in cabinet. Eventually, we're planning to restore this kitchen to look more similar to how it may have looked in the 1940s. The first priority in the kitchen will be to strip the peeling wallpaper, and either hang new paper or choose an appropriate paint color. We're planning to lay hexagonal floor tiles (like these, but likely in black and white) in place of the peeling linoleum. We haven't decided what we'll do with the countertop and backsplash, but it will probably be a few years before we're ready to consider changing them anyway. The existing cabinets will remain; they're solid wood, so we see no need to remove them, although we may apply a new coat of white paint. We'd like to add a dishwasher if we can do so without losing much storage space. As for the other appliances, they're functional and relatively new. We currently have an electric oven and range, which we'd like to convert to natural gas in the near future. Eventually, we may consider purchasing appliances that look slightly more vintage that what we currently have so that the whole kitchen has a cohesive feel. 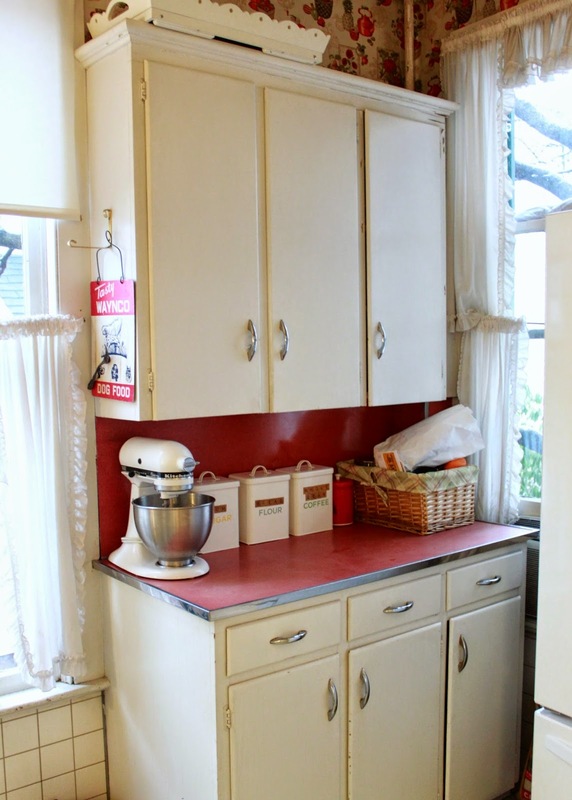 The biggest design decision, I think, will be settling on how retro we want to make this kitchen as we restore it. On the one hand, we'd love for it to look as authentic as possible. On the other hand, we know the 1940s style is very taste-specific and we don't want our kitchen to be a detractor if we ever need to sell this house some time in the future (but here's hoping that time is many, many years in the future). More importantly, we'd like to ensure that we don't make design decisions in the kitchen that feel out of step with the rest of our late 19th-century home. As I hinted before, we're a few years away from doing a kitchen renovation. In the meantime, it's fun to dream about what our "someday" kitchen will look like. Thanks for following along, folks! We have the same type of kitchen. I am pretty sure that our cabinets are exactly the same as yours. There are no built-ins in BHH, but we do have a metal cabinet unit with our sink. BHH had "modern" countertops put in in the 80's or 90's. LOL It will be fun to follow your retro reno. How funny that we both have those same cabinets. Looking at your house tour pictures, I thought you had butcher block countertops -- those 80s/90s updates had me fooled, haha! Thanks for stopping by! 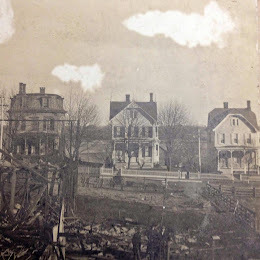 Thanks for visiting The Papered House, a blog dedicated to revitalizing and preserving our 1880s Victorian home. Feel free to contact us at thepaperedhouse@gmail.com.